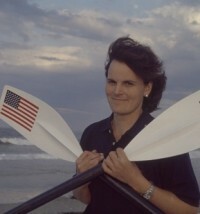 Tori Murden McClure is best known as the first woman and first American to row solo and unassisted across the Atlantic Ocean. She was also the first woman and first American to travel overland to the geographic South Pole. McClure has completed major climbs on several continents. She is the President Elect of Spalding University in Louisville, Kentucky (July 1, 2010). She has worked as chaplain of Boston City Hospital, as policy assistant to the Mayor of Louisville, director of a shelter for homeless women, and has worked with the boxer and humanitarian Muhammad Ali. 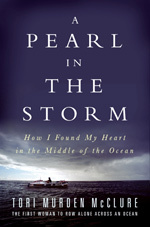 McClure recounts her journey across the Atlantic in her memoir A Pearl in the Storm: How I Found My Heart in the Middle of the Ocean (HarperCollins), finding that what she is looking for lies not in a superhuman show of strength, but rather in embracing what it means to be human. McClure's achievements have been cited in more than a dozen books, and several dozen major magazines. She has appeared on national television programs such as Good Morning America, the Today Show, Oprah, Late Night with David Letterman, the CBS Evening News with Dan Rather, Exhale with Candice Bergen, CNN Domestic and International, The Rosie O'Donnel Show, and several others. A sought after speaker, she has given hundreds of talks to colleges, high schools, corporations, ports organizations, and educational groups across the country. McClure is the recipient of several international honors. She was the first woman to be awarded The Peter Bird Trophy which is given each year to the adventurer who demonstrates endurance, courage, and tenacity in the face of adversity. She has also received a Special Victor Award, previous recipients of this award include Kareen Abdul-Jabbar, Carl Lewis, Wayne Gretzky, Walter Payton, Muhammad Ali, and Jackie Joyne-Kersee. In Paris, L' Academies des Sport honored McClure with a Medal for Sporting Achievement. Other recipients included Betrand Piccard and Brian Jones for a non-stop circumnavigation of the globe by balloon and Lance Armstrong his victory in the Tour de France. McClure holds a Masters of Fine Arts in Writing from Spalding University with an emphasis in Creative Non-Fiction. She holds a Masters in Divinity from Harvard University, a Juris Doctor from the University of Louisville Law School, and she received her undergraduate degree from Smith College. She is a two time Semester Graduate of the National Outdoor Leadership School. She is a Registered Emergency Medical Technician certified in both urban and wilderness settings. She is licensed to practice law in the Commonwealth of Kentucky. McClure and her husband, "Mac," reside in Louisville, Kentucky. "Tori McClure’s personal journey makes her a compelling speaker. She conveys how perseverance and drive can go hand in hand with compassion. She is able to illustrate her personal narrative in a way that doesn’t overwhelm the audience. What Tori has done is extraordinary, but she is able to explain her story in a way that allows participants to apply it in ordinary settings." "Tori Murden McClure is one of the most remarkable women I have ever met; her journey across the ocean is equal only to her journey of the heart. This is a story of courage, adventure, and personal discovery that will appeal to women - and men of all ages." "Unlike Hemingway's The Old Man and the Sea, Tori Murden McClure's true story of a woman and the sea and a boat named American Pearl is one of victory. But her triumph is not merely over the elements. Tori finds the courage to cross the inner seas and discover not monsters but a land of promise and an expanded opportunity to love. If you want to be inspired, read this book. You won't stop till you've finished." "Read this book even if you have never felt the slightest need to row across the ocean, even if you get seasick in your bathtub. But be warned: Tori Murden McClure's story is such a stirring exploration of heart and spirit that you may soon find yourself capable of doing things you never dreamed of." "This account of rowing across the Atlantic is riveting. Certain chapters are terrifying, all of them smart and engaging." "For those six billion or so of us on planet Earth today who will never row across an ocean, this extraordinary narrative by one fellow human who did so transports us to places beautiful, haunting, daunting, terrifying, and uplifting." "In this fine book, Tori McClure generously gives us at the same time a wonderfully told adventure story and a moving account of a storm-wracked journey through self-discovery into healing..."
"The reader of this book encounters a rare spirit whose courage is an inspiration." "A Pearl in the Storm is at once the tale of a familiar dilemma and an account of extraordinary courage. But what McClure's profound and powerfully written romance truly proves is that the measure of her heart eclipses the extent of her valor." "A stirring metaphor for life's unpredictable ups and downs... McClure offers her reflections in contemplative, honest language, revealing her meaningful road to self-discovery. An inspirational story of losing pride, embracing humanity and accepting love." "Epic tale of adversity and triumph." "With her splendid courage and lucid voice, Tori Murden McClure updates an ancient seafarer's tale. Hers is the story of the sheer, bold muscle of a contemporary woman who chose to row for her life alone across the whole Atlantic Ocean. Murden lived the metaphor that rises up from our most challenging dreams: one woman, one little boat, one vast ocean, and the grit to cross it at any cost - and survive."